I think you meant “were” instead of “we’re” botched experiments, but what a clever and interesting take on the prompt. How did you manage to think of Benjamin Franklin for this one? I was completely captivated. Thank you, Jayne! All fixed now. The iPad picture came first, then the idea! I like that you use pictures as prompts. That’s a great idea. This sounds like the start of a terrific book. Thank you, Denise. The word was from Lillie McFerrin’s “Five Sentence Fiction” weekly challenge, and then I perused my pics. It was a thoroughly enjoyable pairing! The pic, by the way, was something I found spray-painted on the sidewalk in Laguna Beach. I was hooked to the very end and beyond; being a Brit I have never seen an American stamp or the 100 dollar bill and was wondering who it was- my ignorance is over whelming! Well done!!! Hi Lizzie-I’m glad “Ben” was there to help! I appreciate you coming by, and love that I could “hook” you, ever so briefly. Oh you could SO do this Indigo. Do it now…”composure” is the word for the next few days-through Wednesday! WordPress knows when you are trying to pass yourself off as suave and debonair, when you are perhaps a badger, but I’m not saying that this is what YOU tried; only that I have had friends attemp this, and they failed miserably. Entirely too much pleasant cordiality among Britt and the reviewers, so here goes some agitation and dissension. Franklin was such a multifaceted person that reckless abandon could easily have been one of his definitions, especially since he was such a proponent of defining oneself, regardless of postage stamps. I’m led to that conclusion by one of my favorite quotes from him, “All things in moderation, including moderation.” So let’s have some discord and disagreement, starting with a few shots at my opinion. Oh dear, it seems that you did not know Ben like I did. History paints with a moderate brush concerning him, but he wrestled with “greater truths” he could not quite articulate. Alas, not even the love of his life could grasp them. His greatest desire, so he told me, was to live among the great Redwoods; exploring nature and his own desires without answering to “his” public in any way. Comparisons to my superhero Ben (who did wear a cape) does have me waxing pleasantly cordial again, but I also subscribe to Ben’s approach to the great unwashed public as encapsulated in his very first pen name, Silence Dogood. Really enjoyed your diversity in this one! Your pieces of writing continue to delight me! I love your visits, Lisa–thank you for enjoying. I thoroughly enjoy yours as well! 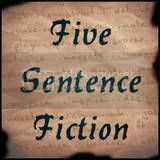 This is so different in subject and tone than the other 5 sentence fiction entries – I thought it was great! Very well written, interesting and a lovely fictional account of an American figure. Well done! Thank you Jo-Anne. I DID thoroughly enjoy working with this one! Had me captivated and hooked to the end. Nicely done, and an original take on the prompt. Sandra, thank you for visiting! Ha! Very smart, Britton! Enjoyable… and different too… good old Ben saves the day! One can always count on Ben! Nicely done. A clever twist on the prompt. Who doesn’t love a good Ben Franklin story?